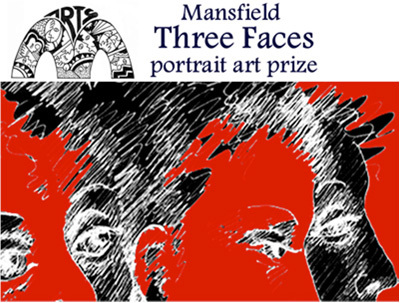 From the Expressions of Interest, 3 Adult and 3 Youth artists will be chosen to compete in the Three Faces 2014 portrait competition. The 3 successful Youth applicants will benefit from a one day workshop mentored by a local artist. Each artist will create a 2 dimensional artwork of the subject who will be an identity from the Mansfield district. The first event introducing the six chosen artists and the ‘mystery’ sitter will include the opening of the Mansfield Portrait Exhibition. The second event reveals the finished artworks and the winner is decided on the night. Allowing artists to photograph and preliminary sketch sitter. The Second event, “The Unveiling”. Dinner event at The Deck on High. Mansfield. The winning portraits are chosen by the CEO, Mansfield Shire Council and Shanley McBurney, curator, Benalla Gallery. Expressions of Interest reply by April 11, 2014. The three participating artists are chosen by the Arts Council of Mansfield committee and the decision is final with no correspondence entered into.